Genesis 2-4 to 3-24 | ARISE! LET US BE GOING! Today’s 8 December – Solemnity of the Immaculate Conception – and… and… it’s set to snow today, perhaps a lot. A good re-post. Meanwhile, in the brutally hot August of Rome it snowed exactly where the Basilica in honor of Jesus’ good mom was to be built, and only there, you know, when tender snowflakes had something to do with water and temperature. Today I am thinking about Saint John Paul II, how he used the phrase “co-redemptrix” dozens of times, I think 29 times. This title for our Lady refers simply to how appropriate it was in justice that one of us who is not divine should ask for such graces perfectly, graces coming directly from her Divine Son. Thank you, Blessed Mother, for being a good mother to us. Continue to show yourself a mother to us! As an old dear friend has so very graciously reminded me, today is the tenth anniversary of the defense of my thesis on Genesis 2:4–3:24, which demonstrated for the first time, with all due analysis of historical philology and unrelenting scientific rigor the text’s reasoning for original sin by propagation not by imitation, and how it is that the mother of the redeemer in Genesis 3:15 is not the wife of Adam but rather is someone future to the writer of the account and who is free from Adam’s sin, that is, from the moment of her conception, she who is the great warrior in the most far reaching battle of the most far reaching war, that conflict between good and evil, between God and Satan, in which the Divine Son of the Mother of the Redeemer is victorious by laying down His life for us, standing in our stead, having the right in His own justice to have mercy on us. I’m thinking that a bit of prayer at the hermitage this very day is in order. Please say a Hail Mary for yours truly. I’m going to ask our Lady for the wherewithal to write about her. The now famous Brake Man, symbol of Adam after original sin, has been chained up for his own security subsequent to the fear of theft by a reader. He’s chained to a metal grate of a tiny opening that vents the crawl space under the rectory. Think of it this man. It might seem that we are chained down by the effects of original sin, weakness of mind, weakness of will, emotions all over the place, sickness, death. But no. With our redemption, with saving grace, we can use those very weaknesses not as a source of our insecurity, but rather as occasions to assent to the solid grip our Lord has on our souls as draws us to Himself across Calvary to where He is lifted up on the Cross (see John 12:32). We are unchained by being chained. Don’t fret about chains. Used them as the cross which our Lord commands us to carry[!] as an encouragement to follow Him, that other command of His. Don’t fret about chains. Let them encourage you to let the risen life and joy of our Lord shine out to others. Having said that, I hope to get to heaven, as do we all, where all chains fall away. This is great Judeo-Christian pedagogy about Genesis: “Male and female He created them.” The men’s restroom at the Methodist Church here in Andrews is labeled “MEN” and “ADAM” even while the women’s restroom is labeled “WOMEN” and “EVE”. You can’t argue with that, can you? I took this picture from my crowded table at the reception after the Noon Good Friday ecumenical service at which I was the preacher. Our Catholic schools could learn from this, making sure everyone understands that while this is a biological and religious issue, not simply a topic to be forced on others by way of specious social engineering. Some readers of the blog and some people in town here in Andrews are terribly appalled at the appalling “thing” next to the front steps of the rectory. Be not afraid. It’s just you. My hermitage neighbor back in Transylvania County, a master welder and mechanic, gave me one of his creations for a house warming gift when I moved into the new rectory (65 years old). Brake Man is made up from brakes, because of which he simply had to be situated within reach of Mary, the Immaculate Conception. Brake Man is a symbol, of course, in so many ways, of Adam and his original sin, which put the brakes on all of us, having us rust away, as it were, until we fall into the grave. But we have hope, what with redemption and the Mother of the Redeemer interceding for us. Brake Man, who is to continue to till the garden even if he is outside of the paradise aspect of the garden in this world, often has a garden hose hooked to his shoulder, continuing to toil and labor in the garden of this world as he does. Of course, that water provides refreshment to the flowers for the Immaculate Conception. How could she not accept flowers from such as Adam? My spirit is as light as a fluffy dandelion being given to Jesus for the Immaculate Conception. Our Lady has granted me this very day a great favor, two, in fact. I feel like a little kid before her, my spirit rejoicing. I’m bursting with joy, smiling from ear to ear. Mentioned in the conversation with the Bishop, who called me up, and with the Bishop bringing up the topic, was my thesis on the Immaculate Conception and my need to make a popular version of it. This is a sign, I believe from our Lady, that NOW’s the time! This will be the little flower I give to her through Jesus, if this is made possible by the providence of her Divine Son. I again dance with joy. Do I ever stop? But that was just one thing. The other is… well… what a gift! I’ll write about that as time goes on. I’m speechless. I too, must be loved by the Immaculate Conception, and by her Divine Son. Thank you, Jesus. Thank you, Mary. St Paul: “conversion” or “veil lifting”? The citation from Acts 9:20 above is the end of my opening salvo (intro and thanksgiving) to the thesis on the reception of enmity (Genesis 3:15) in its context (Genesis 2:4a to 3:24), which was handed over in final form on January 25, 2007, ten years ago. It was defended a few months later. Doing up a popular version is a necessity. It is a project which is every in front of me, but which I never quite seem to get to accomplish. However, I must say that if I am reckoning correctly about a certain recent event in the life of this priest, I may just be able to get to work on this work in honor of the Immaculate Conception and have the hope of getting it published. That would be very cool altogether. For a thousand historical reasons, it is the first time a serious study of historical philology has been made of these chapters with a most pleasing and far-reaching result about the unity of Jewish-Catholic faith, about the why and wherefore of the physical propagation of original sin and therefore the why and wherefore of the Immaculate Conception of the Mother of the Redeemer in Genesis 3:15, rightly called the proto-Evangelium, the very first Gospel, Good News, of our Lord and Savior Jesus Christ. In the Hebrew text of Genesis 2:7 we read how YHWH Elohim breathed the breath of the living ones into the formed dust, with the inescapable conclusion that there is to be life concomitantly supplied to Adam so that, then – Adam now being the subject of the verb – so that Adam might become a living individual. Adam has an agent intellect to draw and keep together that which cannot possibly work together, namely, that which is material and that which is spiritual. That this is the case is demonstrated by how it is that this would come to an end, that is, when Adam, instead of eating from the tree of the living ones, choosing that which is consonant with the living ones, instead eats from the tree of knowing good with evil, that is, a choice which has his intellect dumbed down into a lack of appreciation for that which is good because it now suffers the admixture of evil, that is, in the very perception. Having lost the power of his intellect he also loses the power to keep body and soul together (as he doesn’t know what he is keeping together) and he begins to turn to dust once again. In this catastrophic state, he is tempted to reach out to eat from the tree of the living ones, but will only hurt himself in doing this since he cannot possibly appreciate what it is that living ones choose, for he now sees everything good with an admixture of evil, that is, in an egotistic manner, not with love, but just what he can get out of whatever or whoever for himself. Should he raise his hand to grasp after the fruit of the tree of the living ones, he will be routed by the Cherubim with their flaming sword, the flames of enmity, God’s love, with the sword being that which turns whatever comes to it into its contrary. If he wishes, Adam can be routed to where he can receive from the tree of the living ones, no longer wanting to stupidly grasp after it himself. Meanwhile, grasping at living forever is saying, “Cogito ergo sum,” “I think, therefore I am,” Descartes’ horrific aggression, ever so lonely, ever so individualistic, only hurting himself with his “thinking” which cannot possibly truly perceive what he is doing. Adam didn’t become a living individual by means of his thought, for he could not yet think with nothing yet having come to his senses (as he was not yet alive). Adam became a living individual because he was provided with an agent intellect which necessitated body and soul coming together. Adam was immortal, unless he sinned. He did. The temptation after is to think like Descartes. How sad. But the very Creator, YHWH Elohim, said he himself, as the incarnate Son of the Woman of Genesis 3:15, would put enmity between ourselves and the evil one, that is, changing us with friendship with himself, grace, which he could provide to us in his own justice because of taking the initiative to stand in our stead, taking on the death we deserve, stomping on the head, the power, of the evil one, but he himself being crushed for us in doing this. The question should be asked as to how it is that we can assent to the gift of enmity when we cannot possibly appreciate the fullness of the goodness of God. But God isn’t asking us to plumb the mysteries, to have the beatific vision while on this earth. He is only asking us to have humble thanksgiving. His grace enables us assent by faith, not by demonstrable thought. We cannot put God’s love in a Cartesian test-tube, but we can assent by God’s grace to the fruit of the tree of the living ones, the Eucharist from the Cross. The Grotto on my last day as chaplain in the Sanctuaries of Our Lady of Lourdes in France. If it be God’s will, the successful completion of the Immaculate Conception Project will begin at the beginning. I’ve begun the popular version. So far, I’ve set up a new computer dedicated solely to the project (the two right screens below). I’ve started setting up a workstation, consolidating files from a half dozen broken down computers, installing a new version of WordPerfect, installing a new version of BibleWorks, and have an auxiliary computer dedicated to extra stuff. When Padre Pio met Saint Michael. When Father Byers knew nothing at all. Elijah with the flaming fiery sword on Mount Carmel, Israel. “Out of obedience I am obliged to manifest to you what happened to me on the evening of the 5th of this month of August 1918 [Vigil of the Feast of the Transfiguration of Jesus] and all day on the 6th [Feast of the Transfiguration]. “On the morning of the 20th of last month [two weeks later], in the choir [making the traditional thanksgiving prayers after Mass], after I had celebrated Mass I yielded to a drowsiness similar to a sweet sleep. All the internal and external senses and even the very faculties of my soul were immersed in indescribable stillness. Absolute silence surrounded and invaded me. I was suddenly filled with great peace and abandonment which effaced everything else and caused a lull in the turmoil. All this happened in a flash. While this was taking place I saw before me a mysterious person similar to the one I had seen on the evening of August 5th. [We entertain angels and even the Son of Man and do not know it. How much the angels reflect the Son of Man! And the fiery love of God, issuing from the throne of the Most High, from the Heart of Him who loves us so much, is just that fierce on that sword which transforms us utterly in God’s love.] The only difference was that his hands and feet and side were dripping blood. This sight terrified me and what I felt at that moment is indescribable. I thought I should die and really should have died if the Lord had not intervened and strengthened my heart which was about to burst out of my chest. [We are utterly weak. It is all Jesus.] The vision disappeared and I became aware that my hands, feet and side were dripping blood. Imagine the agony I experienced and continue to experience almost every day. [He speaks also and especially of his embarrassment, for he, as all of us from Adam until the last man is conceived, caused those wounds in our Lord. How is it that he, Pio, or any of us could share such wounds of love for all those Jesus has redeemed and wills to save?] The heart wound bleeds continually, especially from Thursday evening until Saturday. Padre Pio reprimanding the Bishop about the Seal of Confession. Today in the Roman Rite there are two titles of the Mother of God assumed soul and body into heaven which we celebrate, (1) the Immaculate Heart of the Blessed Virgin Mary in the Extraordinary Form Calendar, and in some communities by way of indult also in the Ordinary Form Calendar (e.g., Missionaries of Charity), and (2) the Blessed Virgin Mary, Queen of Heaven and earth, angels and men, in the Ordinary Form. There is hardly disparity here, for she is Queen because she has an Immaculate Heart, for with that purity of heart and agility of soul she assented to be the Virgin Mother of God and also of us, for just as she is the Mother of God because she is Mother of the Divine Person of Jesus, whose human nature she brought to the light of day, so also she is our Mother in that Jesus is Head of the Body of Christ while we are the members of that Body. At the risk of being discounted as a terribly unsophisticated and naive little boy, I should like to dare you – double dare you even – on this very day to pick some actual biological flowers wherever you might find them, say, along the roadside, put them in a bitty vase with some water, and put these in front of an image of our Lady in your local church or oratory. And if there are candles which you can light, why not light one. I am indeed reminded of going with my mom to pray before an image of our Lady at our Cathedral crypt side chapel of a hand carved Pietà at two and three and four years of age. Perhaps I should just grow up, but I don’t want to do that, not ever. The above is the thesis in which all this was demonstrated from the Hebrew text. This took the interest of Benedict XVI, who, while in Lourdes at the Angelus address on 14 September 2008, reversed a lifetime of thought about original sin and the immaculate conception. Hard to see, but there are two Palestinian donkey’s drinking water in the background. Exorcising infused intelligence with the frustration of suppressed wisdom. Torture and interrogation revisited. 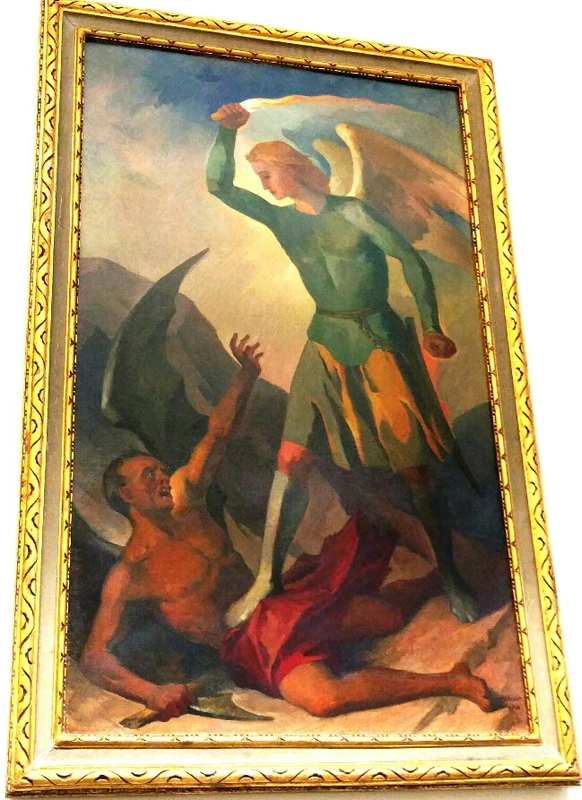 This painting of Saint Michael stomping on Satan hangs in a rather elegant interrogation room in (let’s call it) the security building of Vatican City State. On the one hand, this room is rather unlike those found with ISIS. On the other hand, perhaps the painting is a warning about what is in store for those who do not cooperate. Hey! I’ll cooperate! Really! The irony is excruciating: extreme intelligence, infused, angelic, coupled with an utter lack of wisdom. This is Satan’s punishment forever. In an exorcism, the idea is to make Satan admit his utter lack of wisdom in front of the exorcist, who is incomparably Satan’s intellectual inferior. Such an admission is all too much for Satan, at which point he simply leaves, which, of course, is the admission! It’s rather simple how this works. Satan stomps on someone loved by God not because Satan cares about bothering us, but because Satan hates God; this is Satan’s way to demonstrate his hatred of God to God. Then, hopefully, the person ends up turning to God all the more, which is rather frustrating to Satan: such a person became closer to God because of the occasion provided for this by Satan. Satan sees this countless times, but continues to do his work of hatred all the same even though the torment of the frustration increases all the more. This is a hatred and darkness we had better not be with for all eternity. Much better to go to heaven. There is no middle way. No compromise. In the end, there is only heaven or hell. Choose life! By the way, the artwork above is a bit modern, a bit non-scriptural. The flaming fiery sword is held by the cherubim at the end of the Garden of Eden account, not by any archangel like Michael, though, of course, all those who are with God wield this sword. The sword is meant for Adam and the children of Adam, to turn their arrogant grasping for the fruit of the Tree of the Living Ones unto a humble reception of the fruit of the Tree of the Living Ones. To use this “turn-whatever-comes-at-it-into-its-contrary-sword” on Satan is terribly sarcastic, as Satan can only become more frustrated. That, mind you, is good art. The fiery bit is God’s love, and that love is provided to Satan, but it is precisely this love which makes him suffer, as he rejects such love. His frustration is ineffable. Such a sword of ardent love, of truth, cannot be put in any sheath, but is always drawn, always at work with good effect in those who accept it’s purging effects in all humility. Yes, Jesus does interrogate, and it seems like the very fires of hell are cast at us inasmuch as we resist such fiery love. Peter was grieved to death, death of himself so as to live for Jesus. Is that not, then, love which is provided by Jesus to Peter? Yes. It is. With all that torture, with all that interrogation, with all that… that… that… fiery love! Not so bad after all! Unlike with Satan, we can receive the fiery love of God with all its truth within us. UPDATE: See important exchange in the comments box. Yikes!!! Today’s the day. Genesis 3:15 is fulfilled. Mary Immaculate is The Warrior in her virginal motherhood, by way of Her Seed, The Redeemer. While I do put this up from time to time, forgive me, it is not bragging. It is Mary’s gift to me to give back to her. I say that in all humility (I hope). But it must be said. What I write here (based on a rather intense thesis) followed by six Pontifical Universities in its writing (also by enemies of my conclusions), with no one, including enemies, able to provide any correction or demonstrate that anything is mistaken in any way, presents for the first time (and there are historical reasons for that) that the transmission of original sin by propagation is demonstrated from the Scriptural text, and, therefore, also the Immaculate Conception of the Virginal Mother of the Redeemer. We cry: “Monstra te esse Matrem!” (Show yourself to be a Mother!) Today’s the day she shows herself to be a mother, the Mother of the Redeemer and our Mother. She’s the warrior, the one who is singled out in Genesis 3:15 as going into the battle that is itself the war against the ancient dragon, the fallen Oracle, the deadly serpent whose power will be crushed by the heel of the Redeemer, with that Redeemer Himself dying because of this initiative of love. In honor of the Immaculate Conception on this day of days, in this hour of hours, I offer you the bullet points of the argument and the thesis on which it is based, as well as the audio for the conference given to the IVE in Washington, DC, a few years back. Yes, there is a promise of a Redeemer, the how and the why. This is what Blessed Pope Pius IX was looking for from his exegetes in the early 1850s before declaring that Mary was immaculately conceived… and didn’t get it. This is what the Venerable Pope Pius XII was looking for from his exegetes in the 1940s before declaring that Mary was assumed soul and body into heaven… and didn’t get it. After my Licentiate in Sacred Scripture at the Pontifical Biblical Institute (Jerusalem and Rome), I stayed on in the library to write an STD, though at another University for political reasons. Six pontifical universities were following the progress of the thesis. I gave it to enemies of the conclusions so that they might attack the logic, the method, whatever. Nothing, they couldn’t do it. This was a massive undertaking of historical philology, a truly brutal, unrelenting, historical critical work. In honor of Mary. It’s her gift to me to give back to her. On this occasion of the opening of the Year of Mercy, 8 December, 2015, the best thing I can do as a Missionary of Mercy is to offer this research to the Church. I hope this will be a long and detailed series. This is biggest thank you I can give to Pope Francis for his act of governance on my behalf on 24 June 2015. Why open the Holy Year on the Feast of the Immaculate Conception? Is it because it’s the 50th anniversary of the close of Vatican II? Yes. Is it because it’s the feast of the Immaculate Conception? Yes. Don’t forget, the most emotional moment for the entire assembly of bishops was about Mary, Mother of the Church, a title pronounced by Venerable Pope Paul VI. The applause went for something like 10 to 12 minutes. It’s really hard to clap for two full minutes. This was 10 to 12. In her immaculate conception she has clarity of vision, that is, purity of heart and agility of soul, transformed in grace from the first moment of her conception. In looking at her Divine Son tortured to death on the Cross, she can perfectly see the need of every man from Adam until the last man is conceived. Just for being in solidarity with her Son, she can perfectly intercede for us for what we need. She is mediatrix of all graces, co-redemptrix as one of us who asks for what we need from God, from Jesus. These are her labor pains for us. This is where she becomes our Mother of Mercy.